In 1998 we opened our first Hawaiian jewelry store in Waikiki. With our flagship store in place, we were able to open a wood crafting factory in 1999, making jewelry boxes and display trays to lay our special keepsakes in. These unique wooden boxes, fused with our custom jewelry, created a product that was exceptional, precious and natural, Alamea sold wood rings. Sterling silver dangling earrings, with beautiful cuts of genuine Larimar, and cubic zirconia. Please call for pricing information. Sterling silver drop pendant. Gorgeous blue larimar and cubic zirconia accents. Please call for pricing information. Sterling silver sand dollar earrings. Colorful created opals are accented by cubic zirconia. Please call for pricing information. Created opal sunburst earrings, made in sterling silver. Please call for pricing information. Sterling silver sand dollar pendant, with larimar and cubic zirconia accents. Please call for pricing information. 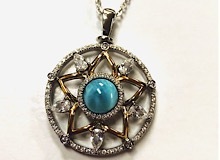 Sterling silver and gold plated flower burst pendant, with larimar and cubic zirconia stones. Please call for pricing information. Sterling silver and created opal palm tree pendant. Matching earrings are available. Please call for pricing information. Sterling silver and cubic zirconia starfish bracelet. 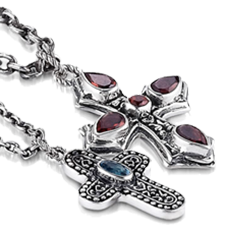 Bracelet length is adjustable, and may be worn between 7” and 8” lengths. Please call for pricing information. Sterling silver sand dollar pendant, with created opal and cubic zirconia. Please call for pricing information. Sterling silver turtle pendant. 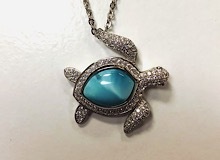 The turtles shell is created using beautiful blue larimar, and accompanied by cubic zirconia stones. Please call for pricing information. Sterling silver shops wheel pendant. The created opal and larimar really set this design off! Please call for pricing information. 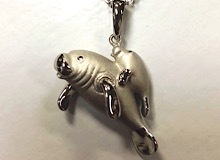 Sterling silver mama and baby manatee pendant with a brushed finish. Please call for pricing information. 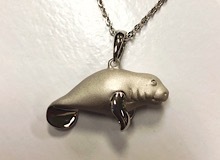 Sterling silver single manatee pendant with brushed finish. There are also matching earrings available! Please call for pricing information. Sterling silver dolphin pendant with larimar and cubic zirconia. Please call for pricing information. Matching earrings are available. Please call for pricing information. Sterling silver turtle. The turtle’s she’ll is created using pieces of Abalone. Please call for pricing information. Sterling silver bracelet with a cute larimar turtle. Please call for pricing information. Sterling silver sailboat pendant using created opal as the sail. Please call for pricing information.